2014 Hydrocarbon production results for Michigan have all been updated into the Michigan database. Merit Energy’s Norwich Unit located just west of Higgins Lake was the #1 oil producer in 2014 at 119,187 barrels. This unit, made up of 288 wells, is referred to as a water flooding unit which means it is in secondary recovery. The per well production for this unit is actually very low at just over 1.1 BOPD. Take a minute to click here to view our interactive map of the 288 wells that make up this PRU (a static image of our interactive map is shown below). Zoom in on our Google map a little and you’ll see black oil markers mixed in with blue water injection markers. Water, which is heavier than oil, is injected in the oil reservoir through wells at the blue colored markers which pushes oil up to the surface at wells located at the black colored markers where there are pumpjacks. Even though this PRU is the #1 oil producing unit in Michigan for 2014, on a per well basis, it wouldn’t even rank in the top 1,000. RMP is compiling and analyzing Michigan production data and making it easier to follow so you can better understand what is getting produced and where. RMP is adding powerful meta data to our map searches to help find wells that are top producers and also wells & facilities that have caused ground water contamination. Our search engine is getting stronger each month and we will be rolling out exclusive new searching functionality that will allow our users to search for things like locations where soil or ground water has been contaminated. We intend to make it easier for people to understand how our natural resources are being used to produce energy and profit and also the societal costs & risks associated with that production. The better we all understand our natural resources, the better we can protect them for future generations. You can help fund our research by clicking here to make a tax deductible donation to our 501(c)3 organization. West Bay’s Jennings 1-32HD1 well produced more oil in 2014 than any other single well in Michigan. West Bay has 5 of the top 10 producing wells in Michigan and they’re all in Jackson county. 4 of those 5 are in Napoleon Township. 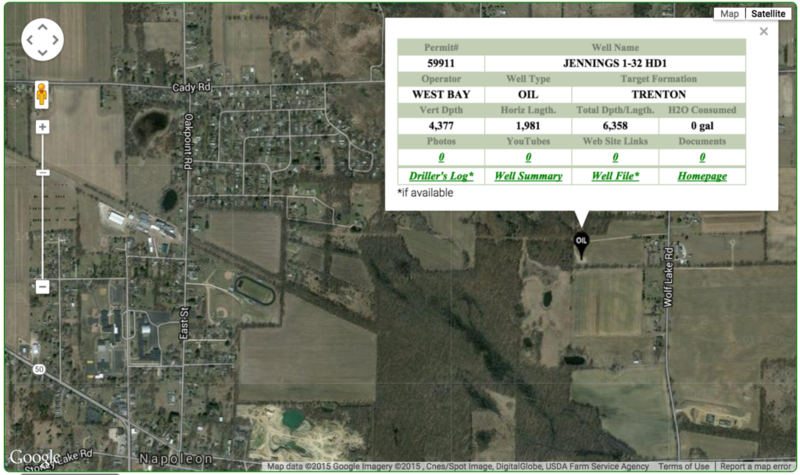 The #2 oil producing PRU in Michigan is West Bay’s Jennings 1-32HD1 well in Jackson county. The Jennings 1-32HD1 well produced 111,357 bbls of oil in 2014 all by itself. The Jennings 1-32HD1 well, which can be viewed on our interactive map here, averaged over 305 bbls/day of oil production in 2014 from the Trenton formation. Even though, the Jennings 1-32HD1 is the #2 PRU in Michigan, it is the #1 producing single well in 2014. Jackson county is home to 8 of the top 10 oil producing wells in Michigan in 2014. West Bay is the operator of record for 5 of the top ten wells and one could imagine West Bay had a good year financially given the approximately $100/bbl price of oil throughout the 2014 calendar year. Savoy has the #3, #4, and #5 producers in the top 10 and they’re also Jackson county in Columbia township. Rounding out the top 10 production units for oil in 2014 is Breitburn’s Beaver Creek unit made up of 35 producing wells. All of West Bay’s and Savoy’s PRUs are 1:1 between well number and PRU meaning there is only one well that makes up the production unit. The Trenton and Black River formations in Jackson county have taken the oil production crown from the Niagaran formation in Northern Michigan which was the top oil producer in the 1980’s and 1990’s. The featured image for this month’s MOGM is the Napoleon 32 Common Tank Battery where more oil was produced in Michigan in 2014 than just about any other CTB in our state with the possible exception of Savoy’s wells in Columbia township nearby. In May, RMP will publish a supplemental edition of our MOGM magazine showing the top oil, gas, and NGL producers in Michigan in 2014. Stay tuned for it and make sure you watch the video version which accompanies every issue of the MOGM here at RMP so you can see where things are on the map and start to learn to use the map yourself. RMP’s interactive map is the best map on the internet when it comes to oil & gas production for Michigan. 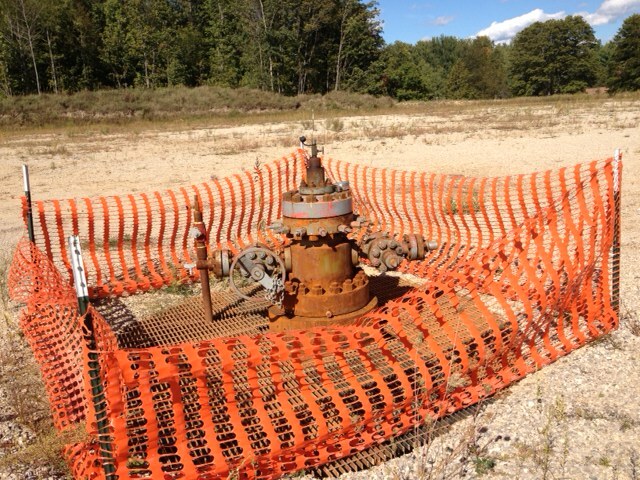 The infamous Lucas 1-13HD1 well in Boardman Township, Kalkaska. This well was issued plugging instructions in April of 2015. In other Michigan oil & gas news the Lucas 1-13 HD1 well had plugging instructions issued. 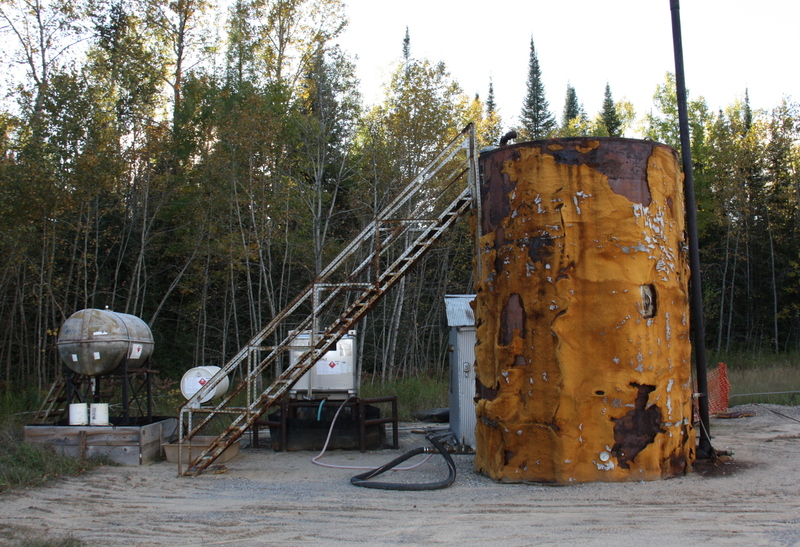 This well was drilled in December of 2010 and marks one of the first wells targeting the Collingwood formation in Michigan’s history. This well got our attention in 2011 as it was one of the first wells to make the High Volume Hydraulically Fractured list. This well had integrity issues with holding pressure and it was very difficult to obtain good information about the well to understand what was going on. Chevron, who purchased the well from Atlas, did not respond to questions because of pending litigation between the two companies. Apparently the casing was faulty and would not hold pressure during pressure testing. Soon this well will be plugged and abandoned and we might never know what terms Atlas and Chevron came to. 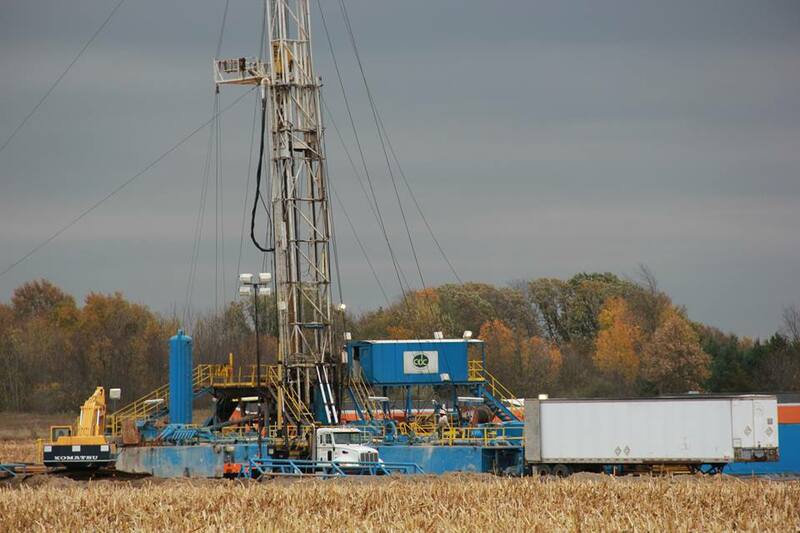 Drilling rig at the Sherwood 1-22 HD1 well on Fowlerville Road in Livingston county in October of 2013. Information also published in April of 2015 was that the Sherwood 1-22HD1 well was plugged in July of 2014. We knew this to be true last year based on some of our on the ground friends who lived near this well on Fowlerville Road. They were sending us pictures and updates throughout the drilling and completing process of this well and indicated to us that it was dry in June of 2014. 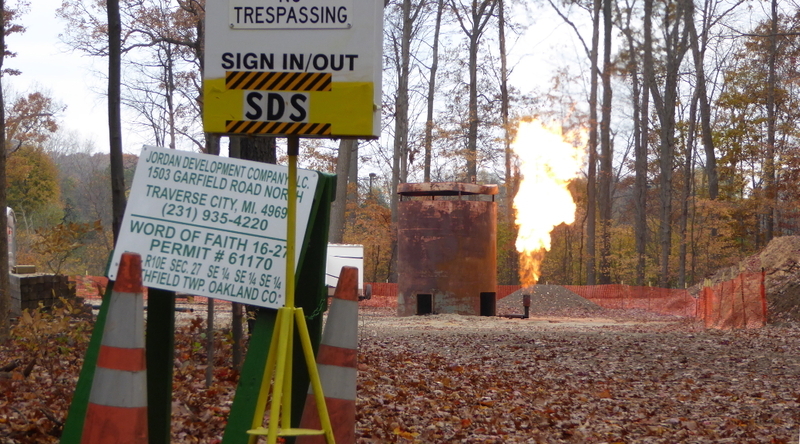 But, this month we officially see the Sherwood 1-22HD1 well on the pluggings list issued by Michigan’s OOGM. 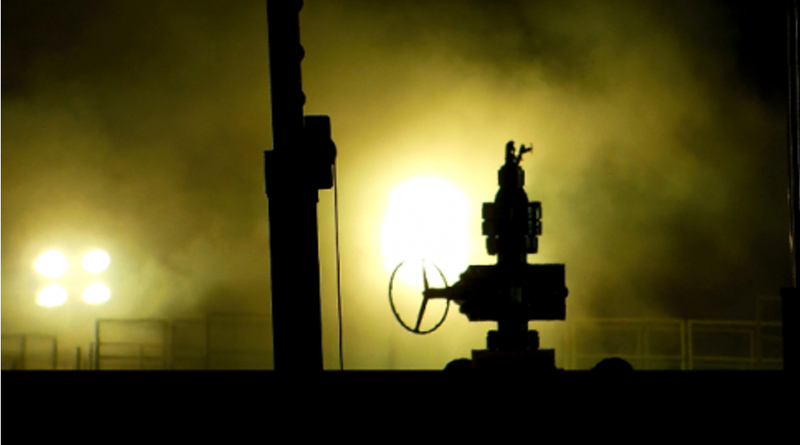 Michigan received 10 applications for new wells in April. This brings the total for the year up to 31. Note that the last application number is A150034 and not A150031 even though this is the 31st application for the year. Michigan’s smart numbering system is helpful for telling you roughly how many applications have been filed for new wells but it’s not always spot on. Some application numbers get used internally in Michigan’s MIR system by the OOGM to process applications to change a well’s status (ACOWS). The number of applications to drill a well will not always be 1:1 with the A# sequencing as a result of some ACOWS. Wyotex Drilling Ventures has now applied for 4 attempts in the A1 in 2015 along with 4 permits that were also approved for the A1 in 2015. This extends what we said last month about how it’s looking like Wyotex Drilling Ventures is making a concerted effort at the A1 in Grand Traverse county. We have seen every recent A1 attempt using horizontal technology in the past few years end up as a failure and even just noted the recent Sherwood 1-22 HD1 failure here downstate. We will be watching Wyotex’s actions closely now that weight restrictions (i.e. Frost Laws) on Michigan roads have been lifted by MDOT. 10 applications were received by the State of Michigan in April of 2015. Click the image to enlarge. All wells permitted this month were seen recently on 2015 applications. There were 8 permits in April bringing the YTD total up to 36. 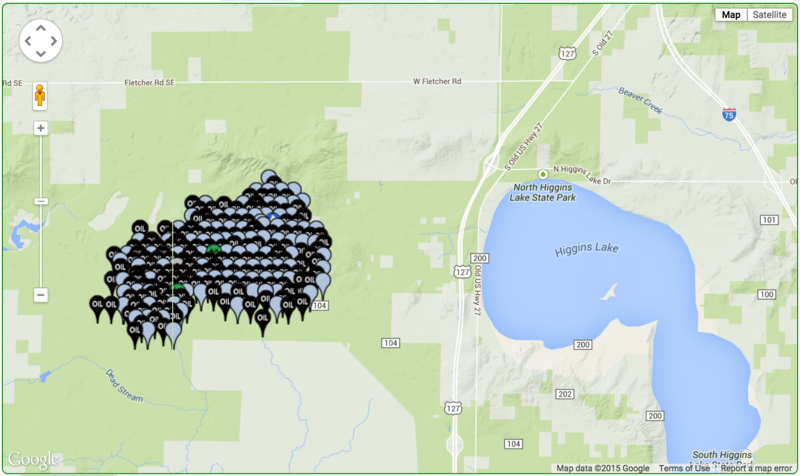 3 oil, 1 Waste, and 4 Storage wells make up this month’s permitting in Michigan. Click image to enlarge. Six wells reported plugged in Michigan is the least amount in a month so far this year. According to Mark Snow, Supervisor Permits and Bonding Unit for the MDEQ’s OOGM, activity was a little slow due to April frost laws coupled with a slow year in general. Click image to enlarge. Although there is not a direct proportion between apps and permits to wells drilled and completed, there is a direct relationship between applications made, permits issued, wells drilled, and wells completed. Below are some key performance indicators or KPI’s in the Michigan oil patch that can be helpful in supporting the findings we publish. The number of permits issued each year is indicative of interest in Michigan hydrocarbon exploration. We exclude the first year 1927 from our ranking system as permits were partial that year. Using 1928 as the first full year of recorded permit history in Michigan we have data for 87 years of activity. 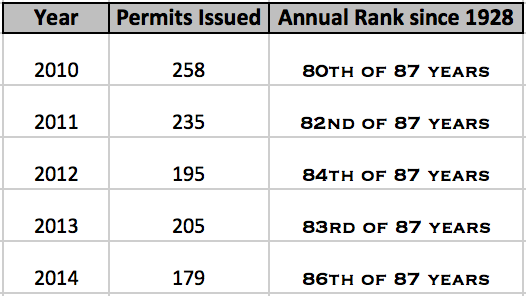 All rankings then are the number of permits in the year specified out of 87 total years. The apex year for permits issued in Michigan was 1992 with 2,024 permits issued. The nadir point was 1931 with 111 permits issued. The 5YR Trend Permits Issued KPI looks at the permits issued ranking over the last five years. This KPI will remain static through 2015 and analyzed against the 2015 permits as we go. Below is the summary of the year, the number of permits issued, and that year’s rank with a denominator of 87 years. Michigan Oil & Gas 5 Year Permits Issued Trend. That’s it for April 2015’s report. Note that there is a video at the top of every edition of our Michigan Oil & Gas Monthly (MOGM) magazine. The video shows the same information as this article but also demonstrates to you how to navigate our map so you can start to learn how to use it yourself. While 100s of you have been reading each edition of MOGM published here, only 30 to 50 views are registering on YouTube for the same report. Check out the videos, they’re easy to watch without all the reading. And, while you’re there, please subscribe to our YouTube channel. No one really likes to read anyway.